Made for the 800th Celebration of the granting of the Charter for Market Rights by King Richard I in 1196. 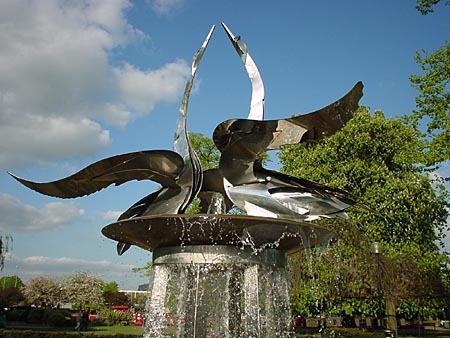 This fountain, made of stainless steel and brass, was opened by the Queen in November 1996. It is positioned in The Bancroft Gardens at the lower end of Sheep Street. Other work by this well known sculptor is to be seen at the Ettington Park Hotel or her studios by appointment. Photographs supplied and are used by kind permission of the Stratford-upon-Avon Town Council.